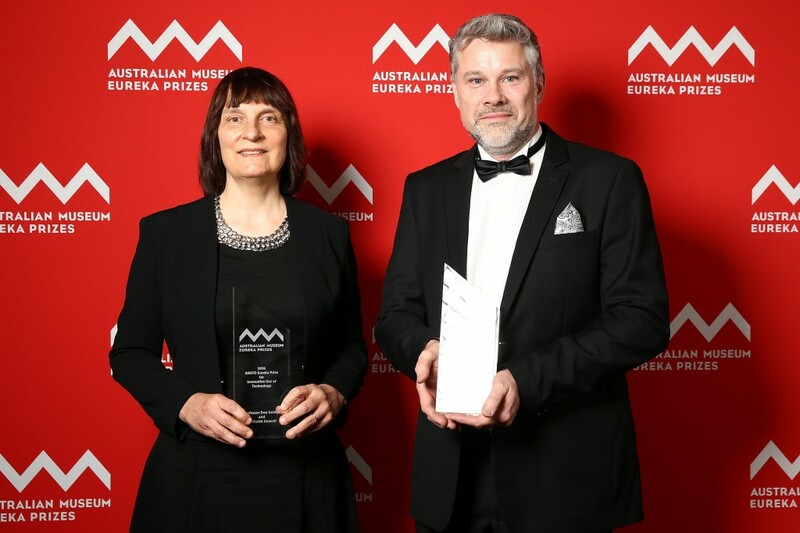 Professor Ewa Goldys, Deputy Director of the ARC Centre of Excellence for Nanoscale BioPhotonics (CNBP) at Macquarie University, together with CNBP research affiliate Dr Martin Gosnell have won the ANSTO ‘Innovative Use of Technology’ award at the 2016 Australian Museum Eureka Prizes. They were recognised for their innovative colour focused research, able to distinguish between healthy and diseased cells, in areas as diverse as embryology, neurodegeneration, cancer and diabetes. “We are absolutely thrilled to be awarded this prize out of such a high-quality field of researchers and scientists,” said Professor Goldys following the Eureka announcement. Professor Goldys explained that with this research, a new window into the body had been opened. The future of the research, Professor Goldys believes, is one of high-impact and significant possibility. The Eureka Prizes are presented by the Australian Museum and reward excellence in research and innovation, science communication and journalism, leadership and school science. Prize winners were announced at an awards dinner at Sydney Town Hall.